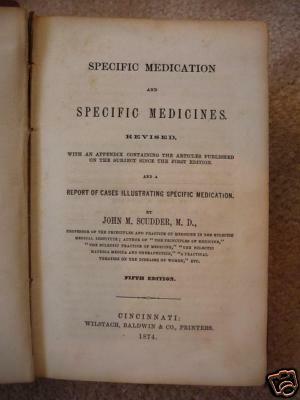 It’s an 1874 edition of John M. Scudder’s Specific Medication and Specific Medicines!!! This may not mean much to some of you, but for those of you who know herbal history, this is a very special find! John Scudder was an Eclectic herbalist who wrote fantastic herbal books, this being one of his better ones! His later (and maybe his best book) materia medica can be downloaded from here and printed out! It’s 770 pages long though… so get lots of printer ink! That is an awesome find!! Okay, one very jealous herbal worker/bookworm here.